Please pay accommodation and Saturday night BBQ dinner direct to Thredbo Alpine Hotel. Also includes 3 course Dinner at the Terrace restaurant Denman Hotel on Sunday evening. Another fun packed weekend away staying at the famous Thredbo Alpine Hotel complimented by a fabulous drive to Thredbo in the scenic Alpine Region which our beloved Porsches have been designed to enjoy. Dinner will be a relaxed social evening Buffet on Saturday night at Cascades Restaurant. The cost will be $55 per person including dessert, tea and coffee. 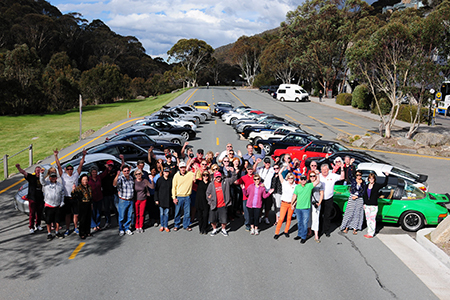 On Sunday will be a driving experience on Alpine roads in and out of Victoria. A self-funded country lunch stop will be organised before returning to an idyllic village restaurant dinner. Registration cost is $70 per person for Saturday and Sunday. This includes a 3 course dinner at The Terrace Restaurant, The Denman Hotel on Sunday night. Registration cost is $10 per person for those wishing to stay Saturday night only. Saturday night dinner needs to be settled by paying the Hotel directly along with accommodation. $152 per night for Twin Share including full Buffet Breakfast. $139 per night for Single Share including full Buffet Breakfast. $17 per day for Kosciuszko National Park Entry.